We offer professional small scale oil pressing line for sunflower seed oil from 1tpd to 20tpd. The sunflower oil pressing plant we designed is fully adopted mechanical driven, which connects each single machine together to extract oil with higher oil yield and at the same time, change the single machines by manual into the semi continuous production line to liberate the workforce. It is really an ideal investing item with little investment, high production efficiency and high profits! 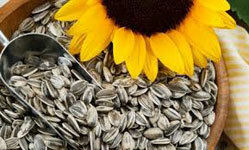 The oil content of sunflower seed is average 30%-45% mostly in sunflower seed kernel. The sunflower is a distinctive, flowering plant, the seeds of which contain a valuable edible oil that contains more Vitamin E than any other vegetable oil. Most sunflower oil is used in food products. The seeds of confection varieties of sunflowers are also sold for human consumption and birdseed. Or you can choose an integrated oil press machine to press and filtrate oil at one time.